Over the past 5 years KCCU has repaid members over $2 Million cash back in the form of Dividends! The average member gets back $20 - $100 a year –Just For Being A Member. Members of credit unions have generally been regarded as progressive individuals who want the best possible service for all of their financial and banking needs and believe strongly that they can feel good about their finances in a like-minded organization. Kingston Community Credit Union understands Ethics and Financial Strength. Over 12,000 members can’t be wrong! Starting back in 1957 with volunteers as a small closed bond credit union, KCCU now has over $145 Million in assets under administration employing over 40 people from our community. KCCU has met and exceeded all of its regulatory requirements for capital adequacy, interest risk management, liquidity, governance, and social responsibility. It has market capitalization of over $13 Million controlled solely by its members in excess of its peers. It is regarded as one of the leading credit unions in the province and across the country. At Kingston Community Credit Union deposits in registered plans are fully insured. Other Canadian dollar deposits are insured up to $100,000. For further information on deposit insurance coverage, please ask for a brochure at the credit union, or call DICO at 1-800-268-6653 or log on to the website at www.dico.com. Kingston Community Credit Union (KCCU) is a democratic financial co-operative. Like most co-operatives, The Board of Directors is elected from the membership and has a say in the direction of the credit union. Members may attend the Annual Meeting each year to participate and vote on dividends, by-laws, directors and to get informed about the credit union’s activities over the past year. KCCU offers a complete line of financial products and services to help you meet your financial goals. Join KCCU today and start enjoying the benefits of your membership! Once you join Kingston Community Credit Union, you can belong for life. All members are welcome to continue using all of our services even if they move, change jobs, or retire. Belonging to Kingston Community Credit Union, a financial co-operative, means that you will be part of the growing co-operative movement. Co-operatives are based upon the idea of maximizing benefit, rather than profit. Banks generate money (profit) for investors who purchase bank stock. Credit Union members have an institution that works to maximize the things they value in their lives and in their community. 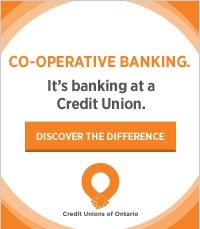 Credit unions maximize benefit according to co-operative principles and its mission statement. The assumption is that there is strength in mutual self-help and that the co-operative has a collective responsibility for the well being of its members. In addition, individual co-operatives strive to create a united co-operative movement, by working with other co-operatives, to improve the collective well being. A great place to bank for all the stages of our lives and the lives of the people we care about – our families and friends. Kingston Community Credit Union has made a long-term corporate commitment to charitable giving of a minimum of 5% of our pre-tax annual income. KCCU's average donations in cash and in kind over the past ten years was in excess of 10% of its income! KCCU has won numerous prestigious awards such as The Kingston Chamber of Commerce's Business of the Year (2009) and for such ideals as Promoting Youth Involvement and Outstanding Corporate Charitable Giving in addition to numerous awards for Co-operation, Social Responsibility, Marketing, Youth Innovation, and Mentorship. Bob Trentadue, former Chair of the Board of Directors won The Gary Gillam Award for Social Responsibility (2010) and in 2013 he was awarded the Credit Union Director's Forum Long Service Award for over 30 years dedicated service to the credit union system. KCCU is fortunate to have such committed and caring individuals on the Board and in management who ensure social justice issues are at the forefront of our corporate philosophy. These beliefs strengthen the credit union system as a whole and help to define us and our role in the community.